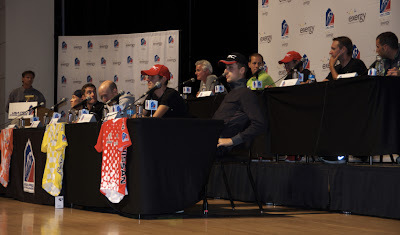 What struck me most about the press conference today for the USA Pro Cycling Challenge is that the riders could answer the questions posed to them in "Americanese," as Phil Liggett called it today. Tom Danielson, Levi Leipheimer, Christian Vande Velde, and Tejay van Garderen joked and used slang with ease. Only Taylor Phinney kept his respectful demeanor (until his Mom chimed in from the audience). But Taylor admitted it has been 4-years since he has raced in the United States, he has clearly become accustomed to European ways. 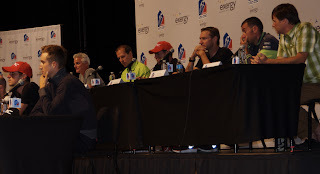 If we can overlook the typical dry questions posed to the riders by the typical squad of press in attendance, there were moments where the personalities of the riders (and race organizers) shone through. For example a response delivered by Levi Leipheimer when VeloNews.com asked him if he could name his short list of contenders for the race, Levi responded, "oh no, this is not my first time at the rodeo, if I leave somebody out I will get roasted." Now is that the kind of sentence a rider could form and deliver in France? It certainly is not, it is refreshingly slangified. Was it the kind of response we wanted to hear in Colorado, it sure was. I don't want to hear who these riders think will win the race other then themselves, I want to hear these riders say "I will win this race, I am going to give it my all, you the fans are going to see an incredible bike race, this is competition, and I am in it to win." 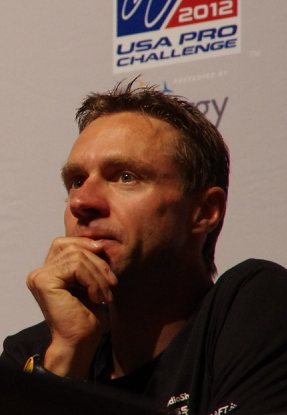 I want to hear exactly what Cadel Evans said - "With bike racers, we want to win whenever we can." Or what Jens Voigt later added in response to a question, "We are bike riders, we want to win where ever we are, it is not important where he [the rider] is from, what is important is that we have one of our jerseys on the stage. We have a variety of countries represented here." Who do you think will win? Can we please retire this question from cycling. We all know the top contenders because eight cycling magazines tell us who might win, no surprises there. It is the job of the press to do the analysis and reporting. It is the job of the rider to follow race tactics and compete. In the end, nobody knows who will win, if we knew that, the fans wouldn't show up to the race. And the fans definitely intend to show up to this race. 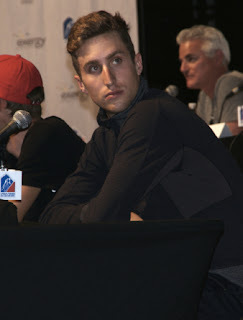 Today, at the press conference, the riders were entertaining and had us all laughing at moments, especially when Christian Vande Velde teased Tom Danielson about nobody being able to have home towns "from coast to coast" like Tom claims to have. Tom was born in Connecticut, calls Boulder home, Durango hometown, and likes Malibu. Tom also lives in Gerona, Spain, but apparently Spain is not one of his "hometowns." 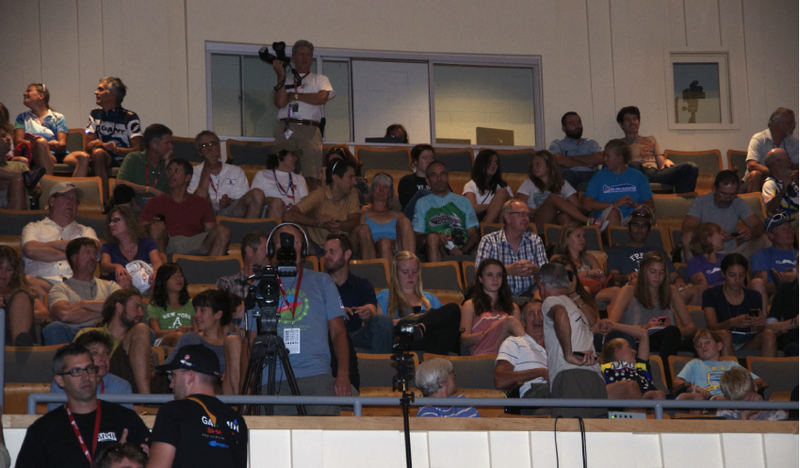 Durango is his favorite hometown ... well at least until Stage 6, when the USPCC enters Boulder. Levi was extremely light-hearted as well and teased Tejay about carrying warm gloves to descend Independence Pass last year in the frigid rain, and then winning the Vail ITT by .11 seconds to beat out Tejay. A day Levi thought was the best stage of 2011. But Monday is a whole new race and nobody knows who will win in 2012. Today I got to watch [back row] Shawn Hunter, Jim Birrell, Cadel Evans, Jens Voigt, Vincenzo Nibali (with his translator), [front row] Tom Danielson, Christian Vande Velde, Levi Leipheimer, Tejay van Garderen, and Taylor Phinney answer questions. This was one impressive showing of talent! The press fired away innovative questions like "Who do you think will win?" The full press conference can be viewed online here: http://www.ustream.tv/channel/usaprochallenge. Or read VeloNews.com or CyclingNews.com.